Draper’s novel intracochlear drug delivery device is an innovative technological solution to treat patients with congenital and degenerative hearing loss. “Hearing loss disorders are a global phenomenon, but there is currently no drug to treat the condition,” said Célia Belline, CEO of CILcare Inc. The inner ear is one of the most remote and protected spaces in the human body. That configuration is a big reason why disorders of the inner ear remain stubbornly hard to treat. In fact, inner ear disorders comprise the largest and most serious class of diseases responsible for hearing loss, accounting for 250 million people worldwide. Even with a rapidly expanding pipeline of potential inner ear therapeutics, the inner ear, in particular the cochlea, remains a challenging organ for targeted drug delivery. Now, a novel device for delivering drugs to the inner ear will be put to the test in a biopharmaceutical industry consortium with the goal of addressing and positively impacting the hearing loss epidemic. 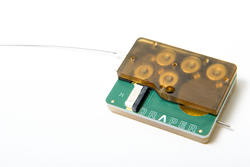 Draper developed the intracochlear drug delivery device with funding from the National Institute of Deafness and Other Communication Disorders (NIDCD) under a NIH Bioengineering Research Partnership, and in collaboration with clinicians and scientists at Massachusetts Eye and Ear Infirmary, to address a number of major challenges in treating hearing loss. For instance, many therapeutic compounds for treating auditory disorders are toxic or have severe side effects when delivered systemically. Injectable therapies encounter a challenge of another kind: the inner ear’s protective round window membrane isn’t easy to permeate. Established in the dynamic life sciences hub of Boston, the CILcare-CBSET-Draper trio is working to assess the ICDD device with the use of CILcare’s hearing loss preclinical models, and the operational support of CBSET’s GLP-compliant and AAALAC-accredited laboratories. In the coming months, the trio will initiate activities to invite biopharmaceutical and pharmaceutical companies involved in ear disorders to expand the consortium. CILcare Inc. is the world-leading services company for drug development in hearing and otic disorders. Based in Cambridge, Paris and Montpellier, CILcare has developed unique know-how to assess the safety and the efficacy of drug candidates and medical devices in drug-induced hearing loss, noise-induced hearing loss, age-related hearing loss, salicylate-induced tinnitus, noise-induced tinnitus and otitis. In addition to the expertise of the team and the strong support of the scientific board, CILcare also benefits from the large industrial background of its three founders. Learn more about CILcare’s expert biomedical research services or please contact us. CBSET Inc. – 500 Shire Way, Lexington, Mass. – is the preclinical research leader in critically important therapeutic fields such as interventional cardiology, renal disease and dialysis, chronic drug-resistant hypertension, women’s health, minimally invasive surgery, orthopedics, biological and synthetic tissue repair, drug delivery, bioresorbable devices, and combination medical device and drug-eluting products. Learn more about CBSET’s expert biomedical research services or please contact us.